In the past week, and especially on the radio show last Sunday, I've been talking with people about the current real estate market. Ask the man who just sold his house, and he'll say the market if fine. Ask the woman whose house has been listed for almost two months and she'll tell you the market is terrible. The truth is they're both right. These days a house has to be priced right in order to sell in a reasonable time. The homes that are not selling are the ones that haven't had any improvements. Not long ago I talked with a man who bought his house two years ago for $345,000 and wanted to list it for $525,000. I thought, "Terrific! He must have made some great improvements. Maybe there's a new kitchen or a pool with a hot tub." But he hadn't - all he had done was paint. I had to tell him that the market simply will not support that kind of price bump these days. But a house that is priced right with a fair profit for the seller and a good value for the buyer – that kind of house will sell in any market including today's. Good professional Realtors® are busy listing and selling, and calming the jitters that the public gets from reading scare stories in the press. This is always a slow time for real estate. It's the last week of August. People are stretching out the final days of summer vacation, doing everything they can to avoid returning to "real" life. Children are starting school, and parents are concentrating on class schedules and new wardrobes, not on finding a new home. So I tell my sellers, "Don't panic. Relax and enjoy the Labor Day holiday." Next week we'll all be refreshed and ready for the good market that is still out there. Today I had the pleasure of sharing the microphone on the WCBM Radio show, All About Real Estate. We had a terrific show with many call-ins, and we covered a lot of subjects. One of our listeners talked about sellers who want to "save" money and sell their homes without a professional. He brought up an interesting point - that even after deducting the agents' commissions, unrepresented sellers UNDERsell their homes by an average of $13,000 compared to what people get when they work with a Realtor®. Price is what people think of first, but it's not the only issue, of course. Sellers who try to go it alone are usually unprepared for the complexity of the paperwork that is part of today's house sale. Worse, they don't know where the traps are that a knowledgeable agent could help them avoid. We hear stories all the time about a sale that fell through leaving the do it yourself seller with a contract that didn't get to settlement, after they've moved on and are suddenly paying two mortgages. As I said on the radio, anyone can sell a house. Put a "For Sale" sign out front and you'll probably get offers. What a Realtor does is not just help you sell the house; your Realtor makes sure you get from sale to settlement. That's when the real work is done. Anyone who has bought, sold, or refinanced a house in the last few years knows that there are stacks of papers that have to be signed before the keys change hands. Fortunately for the buyers and sellers, most of those papers come from the Realtor®, the title company, and the lender. But even before the first offer comes in, sellers should be finding the "other" paperwork. 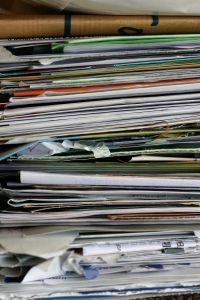 Those are the papers that - depending on how long you've been in your home - might be scattered or buried in old files or boxes. The settlement documents from when you bought the house - these would include the contract, the settlement sheet, loan documents, title insurance, and any others that came to you at settlement. Any other loan documents from a refinancing, home equity line of credit, or second mortgage along with the loan numbers and bank information. Receipts and permits for any major improvement or renovation that you did such as adding a bathroom or extending a deck. Warranty information for any appliances or home systems that you've repaired or replaced recently. Homeowner association, condo, or co-op documents, including any documents that show you've complied with the rules for renovations or additions such as decks or color changes. Tax receipts and bills that will show a prospective buyer what the gas, electric, water, and tax charges have been for the past year. Having these ready as you list and sell your home will help things run more smoothly. And when the house is sold, and you pack those papers to move, keep the first three on the list together with the new settlement papers - you'll need them again come April for tax time. The question is: What can you buy tax free in Maryland through Sunday, August 27? If you have kids going back to school and wanting new clothes, or maybe you are watching the Fall Clearance sales, then this is the time to head to the mall. From the 23rd through the 27th, Maryland is giving shoppers a break – no sales tax on clothes and shoes! The break applies to items priced under $100 and covers things like jackets, shirts, sweaters, pants, and socks. You still have to pay the tax on accessories like handbags, jewelry, and ties, but there’s no limit on how much tax you save provided each item is under $100. The state’s web site for the sales tax holiday is here, and you can download and print a list of what’s taxable and what’s exempt here. If you have shopping to do, now’s the time! Yesterday I was quoted by the Wall Street Journal! The on line article was “Make Me an Offer: Buying Unlisted Homes”, and the reporter, Bob Hagarty, wrote about creative ways we use to find homes for buyers. "Margaret Rome, a Coldwell Banker agent in Baltimore, once ran an ad in the Baltimore Jewish Times announcing that one of her buyers was seeking a "funky" four-bedroom ranch house in a particular school district for less than $400,000. An owner of such a house, which wasn't yet listed, responded, and a sale was quickly arranged, Ms. Rome says." If you’re a subscriber, you can read the whole article on line at www.wsj.com. The best part? August 22 was my Mom’s birthday, and she would have been so proud. Happy Birthday, Mom! There are as many opinions about what the market will do - or is doing - as there are Realtors and real estate columnists. Finding an indicator you can trust is not easy. So I was happy to read about one that I can understand…statues of St. Joseph. That’s right, one of the seller’s favorites to bring good buyers to their home has become a reliable indicator of how the housing market is doing in any area. A recent Boston Globe article tells how a local shopkeeper sees a real estate downturn because these days he’s selling 300 St. Joseph statues a month; when the market was booming, he was lucky to a couple a week. According to the article, "Tradition has it that if you bury a statue upside down and facing the property you are trying to sell, St. Joseph will direct a buyer your way." It goes on to say that the belief goes back some 500 years when it originated in a convent in Europe. Wherever it started, the custom of burying a St. Joseph statue on your property is popular in many places today. I’m not saying I believe it makes a difference, but with the market cooling in some areas, people are probably thinking, "It couldn’t hurt!" We went to Maryland’s eastern shore recently for a quick get-away and some good food. We came back from Ocean City well fed on fresh seafood and with new appreciation for restaurants in Maryland’s beach town. One of our discoveries was an award-winning cream of crab soup. For the last two years, the Ocean City Downtown Association has sponsored a crab soup contest among local restaurants. Last year the Marina Deck’s soup took secondplace, and this year they swept the field. One taste of chef Dennis Kalchthaler’s creation and you’ll understand why. While we enjoyed their prize-winning soup, Carole Spurrier gave us a Marina Deck lesson on lobsters. Did you know that…? American lobsters are found not only in Maine and Massachusetts, but also along the east coast of North America, from Newfoundland to North Carolina. Lobsters grow by molting (shedding their skins) 25 times in the first 5 years of life; an older lobster only molts every 4 or 5 years. It takes about 7 years for a lobster to reach 1 pound, the minimum legal size. After that, they grow just a pound every 4 years. 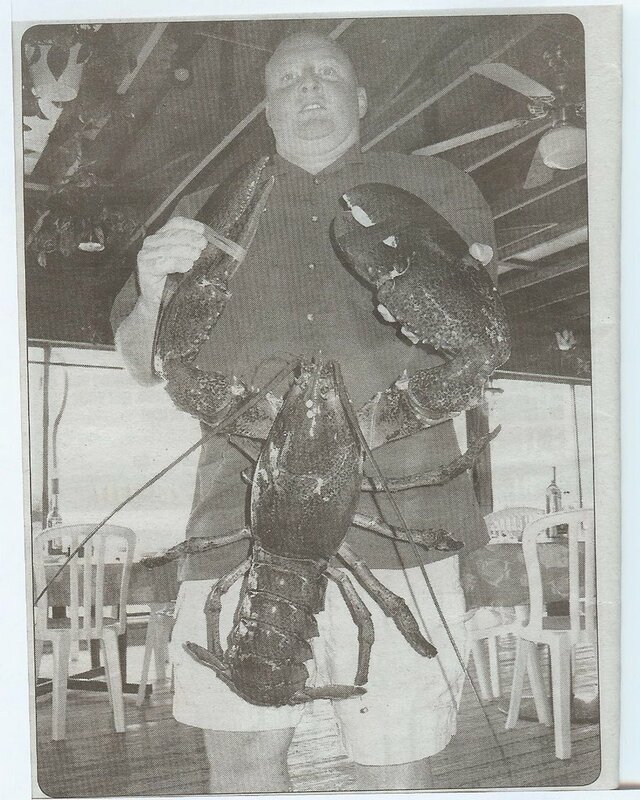 There are limits on the size of lobsters that can be taken in U.S. waters, so if your dinner is more than 8 pounds, it’s probably from Canada. There’s a trick to steaming a really large lobster. Because the claws are so thick they take longer to cook. You steam them until the tail meat is tender then remove the tail and continue to cook until the claws are done. Of course, if you want to cook a lobster like the one in the photo, your first challenge will be finding a steamer pot big enough! For famous cream of crab soup, and lobster cooked just right, you can’t beat our OC! We’ve all had this happen. We work with someone for a while, showing them houses that we think are right, or that they want to see. One day they say, "This is the one – I want this house." Instead of whipping out a contract offer and saying "Sign here," try asking a few questions first. I did this recently and helped someone avoid what could have been a mistake…but I didn’t tell her, she came to the conclusion on her own. I asked, "What do you like so much about this house?" She answered with the obvious things – the land around it, the building that would house her office, a wonderful updated kitchen. Those are the tangibles, the things that are easy to identify. It’s the intangibles, though, that make a home. It’s the intangibles that make you feel safe, happy, and relaxed when you walk into the right home. Or uneasy, annoyed, and ill at ease when it’s not right. In this case, the house was older, had small rooms and low ceilings; these folks were moving from a newer home with high ceilings. When I asked how she would feel walking into the master bedroom, her first response was about the low ceilings. Before long the rosy picture she had painted for herself – she really wanted to like this house – began to change in the light of reality. We didn’t make an offer on that house. Try talking them out of buying that house. If you can, it wasn't right for them in the first place. I passed up a sale that day, and solidified a relationship that will carry years beyond this one transaction. Who's Afraid of a Ground Rent? Maryland is known for many things: steamed blue crabs, the U. S. Naval Academy, interesting politics, the Chesapeake Bay, and that leftover from medieval days…the ground rent. The concept came to America from England with colonists, and took hold in Baltimore in the mid-eighteenth century. We are one of only three states where ground rent has been used extensively: Maryland, Pennsylvania, and Hawaii. While many properties are "fee simple," meaning including the land, there are still thousands in Maryland that have "ground rent." Ground rent is such a strange concept that many people – including some Realtors® - are confused and even frightened away from good properties. Out of state lenders who have never seen a ground rent often need help to understand what it does and doesn’t mean. Ground rent is an annual fee paid to the owner of the land. If you buy a house with a ground rent, you will pay a small amount each year – $100 to $400 or so – to the owner of the ground rent. Ground rents can be redeemed, and if you offer the owner full value, the owner must sell it to you. Annual ground rents are generally 6% of their value, so a $150 ground rent could be purchased for $2,500. If ground rents are easy to redeem, why are there still so many of them around? Because in many cases it does not make financial sense to buy the ground rent when you buy the property. The monthly cost is usually a few dollars. And later you can offer less than full value which the owner might accept. There are a couple of traps to avoid if you decide to buy a ground rent: all owners have to sign off on the sale of a ground rent, and the sale has to be recorded. This means a title inspection, and the process could simply be more costly than it’s worth. The part that scares people is the idea that the ground rent owner could claim the property – and whatever sits on it – if the ground rent is not paid for 6 months or more. But if you have a mortgage, the ground rent will be included your payment so there’s no chance you’ll overlook it. You have many things to think about when deciding to buy a home. If you love the house, don’t be put off by a little ground rent. It’s an old tradition from the days of royal land grants, but a knowledgeable 21st century Realtor will make sure you’re protected. When I first got into the business, I learned that you need to do something to make yourself stand out. If you notice, almost ALL listings end in 000, 500, or 900. I chose to make my listings more visible by using a unique number in each one. Back then I was driving my little dream car, a Porsche 944, and I began using this number on my first listing. I loved my 944, and I love 944 - now I use it on all my listings. When you look down a column of listings or sales and they end with 944…yep, those are mine. I once went on a listing appointment but chose not to work with that seller – he wanted full service for a no-service commission. A short time later, I got a call from an agent asking if I was a partner of agent “X.” When I asked why, I was told he was using “my” number. He took my “rejected” listing but used my suggested price ending in 944. When I spoke to that agent, he told me that I could NOT own a number. I just thanked him because I was getting calls from other agents about this property, but they only wanted “my” listings! He changed the sales price in the MLS that same day. And 944 is still “my” number. Next time you take a listing, try making the price a unique number – one that means something to you – and see what happens! I am trying something different today. The temperature is just Too Darn Hot! Showings and even calls are very Cool. It is like a snow storm or any other bad weather. Only serious buyers are out in these conditions. In Baltimore, it is triple digits and the heat index is making it feel much warmer! I have just taken most of my listings and given a 1/2 % to 1 % commission raise to the buyer's agent. I want to see if this increases the showings, or at least increases the calls. I am hoping this will give more of an incentive to buyer's agents to show and get my properties sold. Now if the calls come in I may have to go out in this heat!